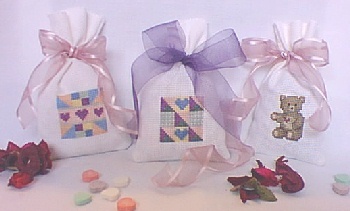 For each sachet, cut two pieces of Aida Cloth measuring 5 1/2" wide by 7 1/2" high. Center one of the designs so that the bottom of the design is 1 3/4" from the bottom edge of one of the pieces of Aida Cloth. Take both pieces and pin them right-sides-together. Stitch 5/8" from the edge along left and right sides and bottom. Trim extra cloth 1/4" from stitching. Fill with Candy or Potporri. Tie it closed with Ribbon. Give to friends and loved ones this Valentines Day!